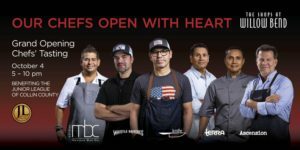 Patricio Sandoval, MEXICAN BAR CO. COCINA, Omar Flores, WHISTLE BRITCHES, John Tesar, KNIFE, Jalal Chanaa and Adham Shanaa, TERRA MEDITERRANEAN and Russell Hayward, ASCENSION. Cap the evening with desserts, coffee, music by the Georgia Bridgewater Orchestra and a spectacular finale at at The District, Willow Bend’s new outdoor venue. $125 per person. To purchase tickets, click here.